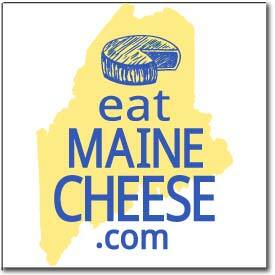 The Maine Cheese Guild has sent Eric Rector to represent them at the 2008 ACS conference and competition, to be held July 23rd – 26th in Chicago, Illinois. At last year’s conference, held in Burlington, VT, many Maine cheesemakers attended the seminars, classes, and other knowledge diffusion events at the conference. In addition, MCG members won 17 awards in the largest US cheese competition every held. We very much hope to build on that experience and success this year. Eric left a week early to also deliver many of this year’s competition entries from the Guild; below is a semi-regular entry of his experience. After tying up loose-ends around the farm, and delivering a last batch of yogurt (until I return) to the Belfast Coop, I arrived at The State of Maine Cheese Co. on schedule at 8:30am, with a cheerful greeting by Cathe Morril, who had helpfully agreed to serve as a drop-point for the competition entries. 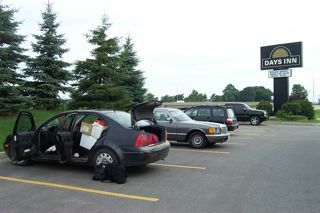 We sorted through the boxes of entries, I cataloged all of them against their packing lists, and made sure to pack them so they could be easily “re-iced” but not soaked in the process, and compact enough to fit into my 2001 VW Jetta, along with all my other stuff. At 9:00am on the dot I pulled out of Cathe’s parking lot (after admiring her new sign), and I was off. Route 17 through Augusta, to Wintrop, left in Jay, right in W. Paris, and another right in Bethel to get onto Route 2. Gorham, St. Johnsbury, and then Derby Line before I entered Quebec. Eventually I made it to Montreal where I picked up my father at the airport (he found a cheap flight to join me on the drive). We left Montreal and got about 100 miles down the St. Lawrence River before stopping at Brockville, Ontario for dinner and the night. Our motel offered a refrigerator (to refreeze ice packs), and an industrial size ice machine (for more cooling) to keep the cheese in good shape.